We are flying Brazilian Drum & Bass hero DJ Patife all the way in from Portugal just for the occasion! This smiley gentleman has been pushing the Sambass and Latino DnB vibes since they first made their mark on the scene around the late 90s/early 2000s. Alongside his pal Dj Marky he's still churning out the summer rollers all these years later with his recent Sun & Bass compilation on the legendary V-recordings amongst other releases. We can't wait to have him close the main room for us in style! Hailing from London, The Busy Twist are a strong favourite of the TTP's with their heavy and grooving fusion of afro/latin styles with UK Bass music. Much loved for their debut single 'Friday Night' they continue to grow and grow with tours in Columbia and exciting new works/collaborations with artists and labels such as Nidia Gongora and Chongo De Colombia, Palenque Records, Systema Solar and Ghetto Kumbé. to have them headline the top deck for us! 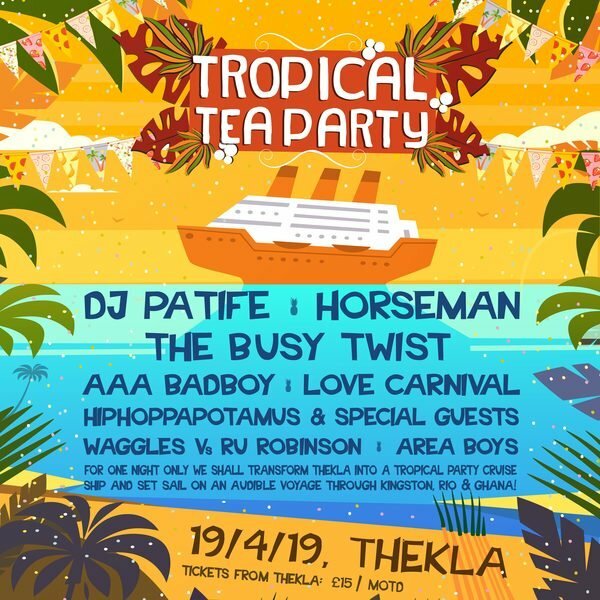 Tropical Tea Party's chief noisemaker and music programmer, if you're familiar with us at TTP I'm sure you already know about him and his love for fusing tropical sounds with all forms of dance music be it Boogaloo with Breaks, Afrobeat with House, Reggae with Hip Hop or Brazilian with Jungle! He's bringing a special guest or two for this one so watch out! AKA Kaptin, AKA Boomtown Fair's head of music, this badboy is an all-round legendary nice guy and a self admitted music addict! We've never met anyone with such an ear for so many styles of music from across globe, and with a particular love for Reggae, Dancehall, Afro, Soca and Global sounds we are VERY excited to see what he pulls out of his collection for this one! Two of the most lovable music maestros in Bristol they will be trading their favourite selections of world music, party tunes and global infusions for a whole 90 minutes! Celebrating one of their birthdays in style the Area boys will bring their love of rootsy global music and finest selections of audible sunshine from Soukous to Afrobeat and from Cumbia to Baile Funk! The official 'godfather' of TTP and one of the founding members plays an eclectic set of worldly and party treats!